Each is shown in relation to major trails (Santa Fe Trail, Oregon Trail, Smoky Hill Trail, Pony Express), roads, and rivers in the state. Dates of each fort's operation are also included, as well as a detailed paragraph about each post, summarizing its history and current status. 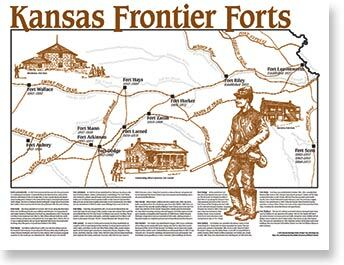 New artwork features several surviving historic military structures around the state. Printed on parchment-like paper, this map is ideal for classrooms, libraries, and offices. PRODUCED BY THE KANSAS HERITAGE CENTER.